HANGZHOU, China, Nov. 16, 2018 /PRNewswire/ — In an effort to foster digitalized global trade, Camel Financial launched the beta version of Digital Trader (DT) during the Money20/20 China event in Hangzhou. DT is a B2B payment tool for international trading and focuses on promoting the facilitation of exchange settlement, safety compliance and intelligent datalization. DT’s target market is the international wholesale markets across China where the flow of trade funds is not smooth, the quality of the purchase is not stable enough, and not all trade participants understand the trade process and policy needs clearly. DT directly provides users with online international settlement of trade payment and integrated services. Global buyers through DT can complete purchase orders, payments, cross-border trade contracts, orders with multi-level suppliers, exchange settlements, real-time order controls, efficient promotion of cargo collection and customs clearance inspection processes, in addition to financial and tax settlement. “Trades in traditional wholesale markets in China is completely un-digital. 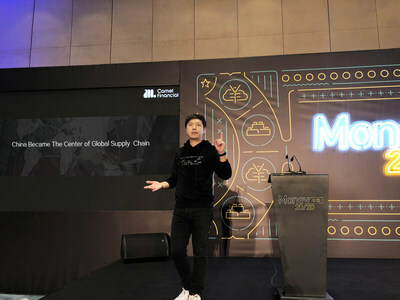 What we are doing with DT is integrating information about funds, goods, logistics, and custom clearance online and linking all parties involved in the international trading process,” said Carson Huang Mihan, Founder and CEO of Camel Financial. Doing trades in wholesale markets is not easy, but making payments and getting paid shouldn’t be a headache. DT is making it easier to manage trade from one easy-to-use mobile application, giving global buyers and merchandise suppliers more time and resources to dedicate to growing their business. DT is supported and closely supervised by government regulations and banks. Regulatory authorities can clearly review and monitor the flow of funds, goods purchasing and export information. The trade route is very transparent and visible with DT. Also, Camel Financial’s strategic and global cooperation with Mastercard greatly enhances DT’s user experience. The strategic partnership is based on Mastercard SendTM, a cross-border payment product enabled by the leading payment technology company. The cross-border support services will provide fast, secure and efficient money transactions for DT users from the Middle East, Africa, Europe and other countries and regions. Camel Financial explores a new B2B payment business revolution. “We’re on a mission to digitalize global trades,” said Carson Huang. The launch of Digital Trader is the kick-starter of this journey.